Upward mobility is a major selling point for candidates, especially for those who aspire to work in a management role. However, shifting from worker bee to management isn’t always easy. The transition can be fraught with obstacles, juggling not only the new tasks that need to be accomplished, but also overseeing the very people that were once your equals. It’s part of the reason that approximately 60 percent of managers say the stresses associated with being promoted to management are on par with going through a divorce. Playing the role of manager is a delicate balance. You have more responsibility, so your directives need to be followed, but you also don’t want to cast an impression of superiority, which can result in resentment. You can walk this fine line by being a “servant leader.” A term coined by Robert Greenleaf, servant leadership is exhibited when individuals seek to serve others first and foremost, which can inspire employees to adopt the same approach. In short, servant leaders focus on the growth and professional well-being of the people they supervise. Let’s say you started at a company at the same time as a co-worker with whom youre friendly. Having to go to you for assignments may be awkward in the beginning. If you sense something is different between the two of you, see if you can talk to him or her in a one-on-one setting, Forbes advised. Alternatively, you may want to take a more proactive approach by having a conversation up front to set expectations about your new work relationship and also ensure there are no hard feelings. 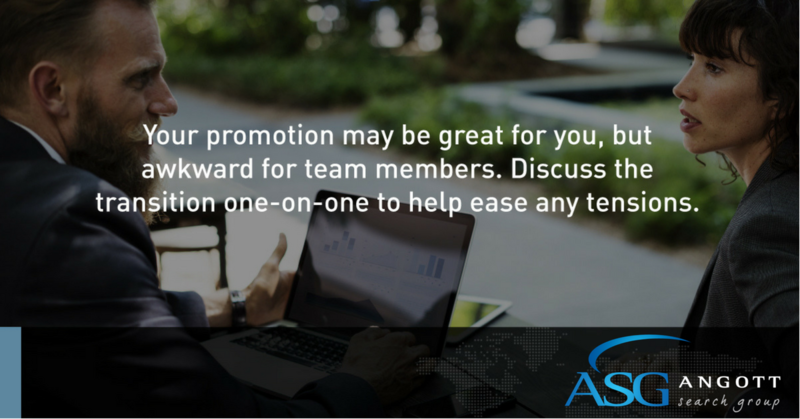 Its only natural that some colleagues might feel disappointment or even jealousy if theyve been hoping for a promotion, especially if he or she was vying for the same job title as you. Getting everything out into the open helps establish a management style that prioritizes relationships with employees on an individual basis, which can help you foster trust and strong engagement over time.